Star Wars: The Old Republic seems to be doing well since its switch to a free-to-play model – very well, according to BioWare. But do we have anything besides the company’s word to go by? As we alluded to in last week’s F2P Cast, BioWare’s claims of doubling their revenue may stem from the game’s, shall we say, less-than-friendly free-player restrictions. While I’d imagine that players who do stick around are spending more per person than in most F2P games, the data does seem to indicate a significant boost in the overall player base. A free-to-play switch is usually like a “second launch.” And we all know how first launches tend to go in the MMORPG world: tons of initial excitement, followed by a rapid drop-off and either a stabilization or a continued plunge, often into irrelevance. While we can’t track player numbers explicitly, we can do the next best thing and look at user activity on the game’s website, which tends to be a reasonable analog to a game’s performance. The spike at the far left of the chart dates back to the F2P switch. There’s the usual drop-off right after, but then take a look at what happens. The numbers stay rather steady and actually see a notable build-up starting in late February, with the only negative action having occurred very recently. So maybe most people didn’t immediately log in, see how much the F2P implementation sucked, and then immediately logged out. One other possibility is that, even with that large influx right around the F2P switch, maybe people trickled in over the next five months or so, trying and abandoning the game just as quickly – or actually sticking with it. In any case, the game has been considerably higher over these past few months than it was prior to the F2P transition – a generally good sign. That January jump is from F2P. 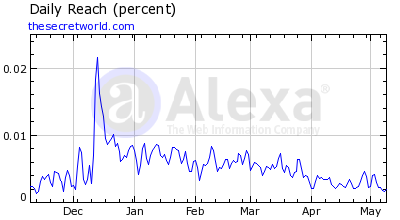 It’s followed by another spike in February, but the game’s been in constant decline since then. That fits the standard model of how we expect these things to go: big jump right at the transition, followed by steady decline. 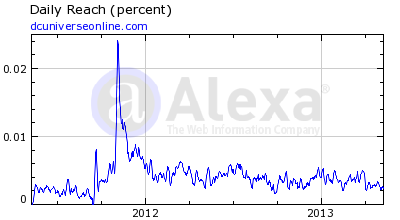 COH went F2P in September of 2011, which corresponds to the spikes on the chart. 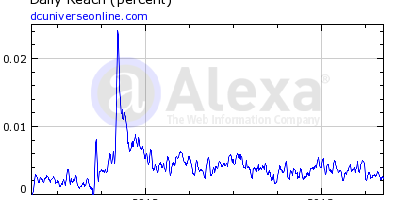 There’s another spike in November/December, but by the time 2012 rolls around, the game appears to be back down below even what it was prior to the announcement. Other spikes on the chart correspond to the F2P announcement (June 2011), the shutdown announcement (August 2012), and the actual shutdown (November 2012). That’s not too bad; the game’s stayed fairly steady in the period starting about two months after its F2P switch in late 2011. Again, none of these charts are hard-and-fast indicators of how many players are in a game, but in the absence of any other solid information – which can generally only be provided by a developer, no matter how much we regular players might think we know – they’re as good an indicator of a game’s health as we’re likely to get. 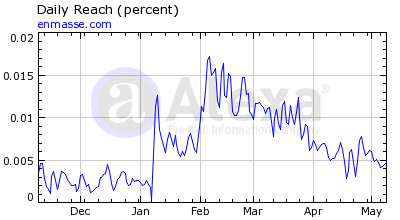 Going by this data, though, none of the other titles we looked at have performed as well as The Old Republic has, growing its traffic numbers for nearly five months following its F2P transition (after the initial, unavoidable drop-off). 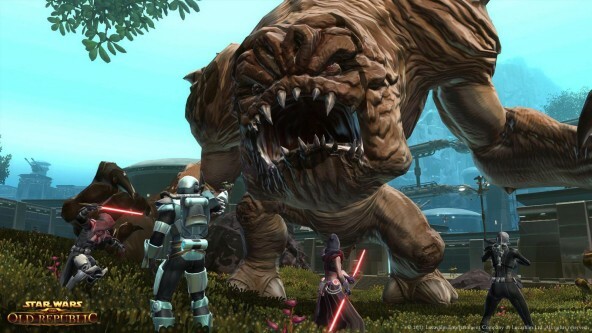 SWTOR might take years to make good on its initial investment, but at least for the moment, it seems to be doing relatively well, its recent dip notwithstanding. Will that be the new trend, and will the game decline over the next few months? We’ll just have to wait and find out. I honestly like the game, even if you are a F2P. I guess that’s just me and because I’m really dedicated to the game. But I can agree that the restrictions are really annoying. I find the game rather well done. It may be grinding at times but the story element and the conversations they put in the game keep me playing. If they took out the restrictions, it would be more enjoyable. A remarkably poor game, made worse with a cash shop that now is linked everywhere, and only extended a little with the latest expansion. It’s stories, classes, raids and crafting system might keep you entertained for approximately a month or two, if you are a subscriber, but the game will leave a rather bitter taste for anyone who has played mmorpgs before. And this is all from a previous subscribers point of view. Add the ridiculous free-to-play restrictions to it, and you have the full picture. BW had few decent ideas, but messed up big time here. It certainly feels like all the updates from hereon are just for the purpose of softening the blow after spending $200m on it, and that happens by milking players, subscribers and f2p, in every possible way. It is possible to get most of out of the game without paying a cent, but it takes a lot of grind, planning, and some subscriber friends. Ironically, it may actually make the game more interesting. 3. The ones who somehow think this is a good idea for F2P? I guess only the people from category #1 are avoiding this..so the rest are apparently enough, combined with the subscribers, to keep this game floating. I’m not sure how to react to this except..meh. I just want to throw this out here about SWTOR that I think most people don’t realize about the game is that you can buy Cartel Items from players on the trade market with the in game currency including unlocks for the restrictions most people always complain about such as hiding your helmet lol which is silly imo as well but it cost barely any creds to get, there is a credit cap for ftpp but there is only a few unlocks that are higher then the cap which are usually unlocks for your entire account or mounts, just the character unlocks on restrictions etc are fairly cheap, and even the items higher then the cap you can get trading items for it instead of creds, Most the restrictions you wont even notice anyways if your a casual player in the first place, and while your leveling you will have most everything unlocked before you even get to max level, a lot of players and guild will even help you buy unlocks because they really are not expensive at all and in game currency is really easy to get. you forgot one critical detail.yes you can trade with other players for unlocks,but you can’t trade or use the mail system on a f2p accunt till you have spent 5 bucks.So no you can’t unlock everything for free.Also depending on which server your on th prices players charge for cash shop items is not always reasonable.And as someone that used to be a subscriber before the f2p transition.And even stuck around for a couple months after.! month as a sub then one month as a f2p player.When add the cost of your class abilities and gear repairs.And the fact I’ve seen players selling even the cheapest unlocks at 100k credits,And without your crew skill unlocks your not making credits that fast.until hit level 30+ credits come slow.And since they penalize your xp unless you buy bost or sub.You will notice the restrictions even if your a casual player.the difference being the casuals just plan don’t care.I get it your a swtor fanboy,and as a sub game it’s not a bad mmo.But as a f2p it’s complete bs.So please don’t go misinforming people claiming the unlocks are not exspensive when truth is the unlocks are sold by subbers and they charge an arm and a leg.And if you don’t drop any cash ever you can’t even buy any thing off other players.And most guilds don’t even acept players under a certain level,accept a handful that aren’t that active.My advice to anyone thinking about playing swtor don’t unless bioware changes it’s f2p model.And since Bioware is EA’s slave it ain’t happening in anyones lifetime. It is a fairly bad mmo even as a sub. I was subbed for months, and several of them just to help my guild as the game had nothing to offer anymore. The Repopulation, April fools day patch notes: kill 10 rats, kill 10 more rats, kill more rat-like creatures. SWTOR, actual gameplay: kill 20 sandpeople, kill 40 more sandpeople, spend entire planet killing sand people, occasionally also poisoning or destroying their water supplies. Then head into caves to kill more sandpeople. Replace word sandpeople with another race for another planet. 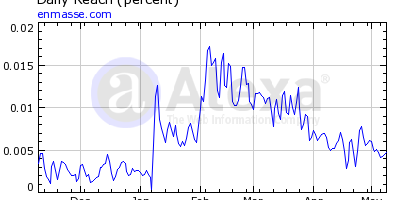 Wait….the graphs are based on a game sites traffic? I bet we can think of 20+ games that are 100% healthy and have very innactive sites compared to other games. I wonder where LOTRO fits in to the F2P model? I thoroughly enjoy and think for a change wb is actually doing a decent job of keeping it entertaining. SWTOR is a joke, it states that the game is Free to play, but its not, i have tried the game out and it turned out to be a joke, the game was so restricted that i couldn’t even breath when i was thinking about it. some of the most “fun restrictions” are weekly based, not daily, like,dafuq ???? WEEKLY? i left swtor, because as a F2P player you get bored really fast, literally. Not worth the time,unless they change their restrictions, they’ll probably end up soon dead,as there are so many real “f2p” products that will be released, somewhere arround the upcoming summer we’ve all been waiting for. You do realise that as a f2p player that is unwilling to spend a cent in game, your coming or going is of no consequence to the game’s success? You could not be more wrong Wibo. I can guarantee that only a fraction of the F2P players in swtor have spent any money whatsoever. Bioware’s F2P idea was indeed made to mess with your wallet harder than the police messed up rodney king, BUT F2P has breathed life into the game with people who are just there. They want money but they also want people existing in their virtual world–otherwise we end up with the same problem as before where there simply were not enough people queueing for content and the subscribers were furious. For (prior) failing games like swtor, they wanted more people at ANY cost..and that includes free (though their “idea” of F2P is rather rubbish, but that’s besides the point). 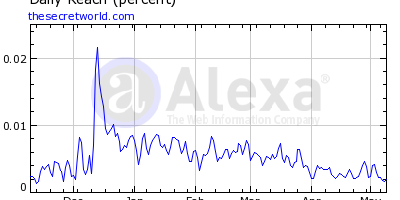 Aside from web traffic, are there any good sources of traffic data? Xfire is one, but that only tracks gaming activity for Xfire users, so I use it as a way to compare activity for games on a relative basis. Statistics are one thing but morally these guys are as horrible as F2P games come. Just to play as I’d want to subscription-free it’d cost me in the ballpark of about $600 for all the ammenities, tweaks and account features upfront. That’s outrageous even by F2P standards. In the long run you’re actually LOSING money by playing F2P if you intend to buy anything since I’ve heard you can burn through this game’s content in less than a year’s worth of playtime. Even a year on subs is only $180 and that’s not including the deal they give for longer sub-time packages. The F2P in this game will drain you dry if you want to play the game irritation-free and that is my problem–even other hybrid F2P games don’t screw you as hard as this one. So while I applaud your analysis Mr. Winter, to me it shows how many people are absolutely gullible and willing to be bilked for their money by those guys. True story: I was once in a meeting for a game my company made and when the talk came of how we could increase profits, it was said we had two choices: either get more players or squeeze more out of our existing players. An F2P model like SWTOR’s seems to try to do both of those at once. Too true Mr. Winter. Ah…how I pine for the days when a subscription was an all-inclusive package with access to everything, bar none. Mr. Winter might want to become a politician instead of creating optical illusions. It’s not an optical illusion. Some of the games performed better than others, but it was all relative to how they were doing previously. This article wasn’t about which game had the most traffic post conversion but instead how the traffic behaved post conversion. Relative to each game they all had an increase in traffic that was measurable. I never claimed that all the games were doing exactly the same. But if one game’s site has 100% more traffic it had after its F2P switch and another has 20%, I could reasonably assume that the first game did better relative to how it was performing beforehand. When SWTOR went f2p i did not even installed it to try it for a few minutes. I knew about their f2p model and i seen no point in losing time with it (even if i pride my self in having tried most of the f2p games out there). I will keep away from that game until it changes the f2p model or until after it dies. I would also like to say this have been a very interesting article. 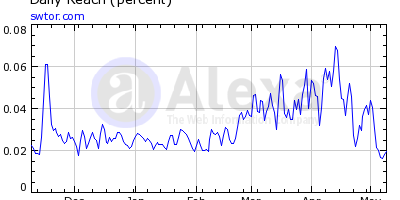 Even if those are only site stats, it is still interesting to see the patterns. Good job Jason. The force is strong with this one. Well in earnest, considering how much money it was making as a sub game (not a lot really, game was heading to closure), when they say “we doubled what we made” means just they stopped getting small penny out of their buck. Most likely their big influxes in income came from people having to make that one purchase to get a different account type status and at best for some more critical UI/systems they made you pay for. But I seriously don’t see this skinning working in long term. At which point they’ll probably downgrade it to a more regular type of F2P model, charging for expansions and whatnot instead, thus getting another player-base boost and possibly another income influx. If the game mechanics / gameplay aren’t great and don’t evolve, then no matter what gimmick / brand you throw in the mix. The game won’t keep going strong even if you do indeed update content every 6 weeks or so because it’s just the same recycled tired base underneath…..unless the game has a huge fanboy base then…. CBA to search for real stats but I do wonder how they made the comparison ‘doubled revenue’ since ftp. I actually wrote an article like that a few years back on my magazine’s website. Let’s see if I can find it, that basically wondered if the F2P switch was just a brief anomaly in a game’s life cycle that didn’t really amount to much in the long run. I think now that it can make the difference between a game that’s struggling and make it profitable, but only if it’s just barely in the red. If it’s awful beforehand, F2P won’t suddenly turn it into a winner. Wow good job jason .. kinda of strange scales…. Well this is interesting, haven’t seen something like this on MMOBomb.com before…. Good article. Seems to early to tell about SWTOR. Plus you had to resub for a month to get the free cartel coins for previous subscribers. I like your work, Mr. Winter. I like it a lot.